The special edition of ‘Catacomb Resonator’ comes in a screen printed graphite grey tote bag carrying the Arktau Eos ‘Catacomb Compass’ symbol and is limited to 60 copies. 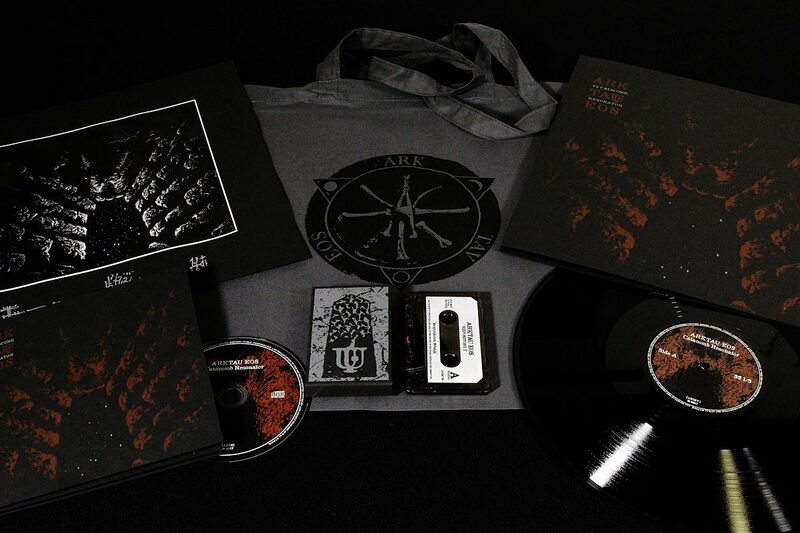 This edition includes both the ‘Catacomb Resonator’ CD and LP, as well as an exclusive insert suitable for framing, sigilised and numbered by Arktau Eos and the cover artist KTL. The special edition is accompanied by an exclusive C-50 cassette album ‘Repository I’ housed inside screen printed covers. The occasional ‘Repository’ tapes contain material that for some reason falls outside album contexts proper: private meditations, lengthy experiments & so forth, which may yet be of interest to the most dedicated of Arktau Eos’ listeners. Tape #1 opens the series with “Avaruuksien avaaja” and “Syvänteiden oraakkeli”, both running to 20+ minutes.